FOR LAST MINUTE RESERVATIONS OR TRIPS NOT AVAILABLE ONLINE, PLEASE GIVE US A CALL AT (305) 743-2444. This activity requires a minimum of 3 divers. 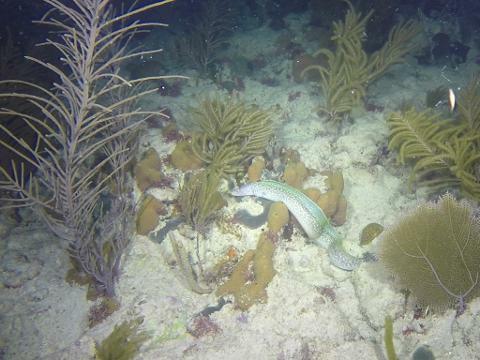 If you are booking your Night Dive within two days of your dive trip departure and you have less than the minimum required passengers, please contact us by phone @ 305-743-2444 between the hours of 8AM & 5PM. We can give you an update as to the number of divers and we can get to work to try to fulfill the minimum requirement. First, at Capt. Hooks, we do it a little different. We dive the reef during late afternoon/early evening in the daylight. Then, we come aboard after the first dive to witness some of the most breathtaking sunsets that the Keys are noted for. 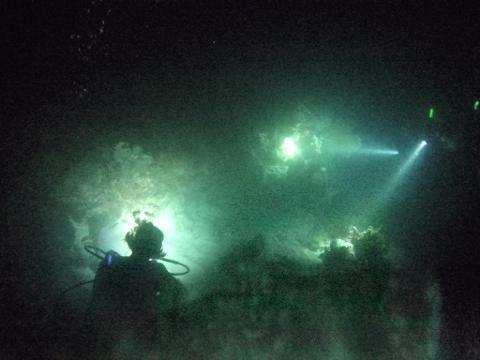 Then, we dive the same location in the dark, at night, and watch the transformation of the reef right before our eyes. 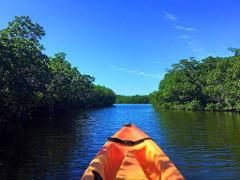 It is a fantastic way to take in the splendor of the Keys. Again, we provide a divemaster in the water with you to point out the changes and the highlights of the reef, if you choose to follow. Following the divemaster is only by choice, and many choose to explore on their own with their buddy. 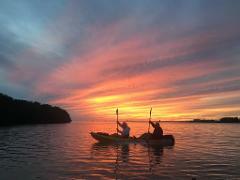 Regardless, it is a unique and fulfilling way to spend an evening in the Keys. Tanks, Air, Weights and Weight Belt are included. Do you need any other rental gear? If so, you will have the opportunity to order additional gear once you confirm the dates that you are diving. At Capt. 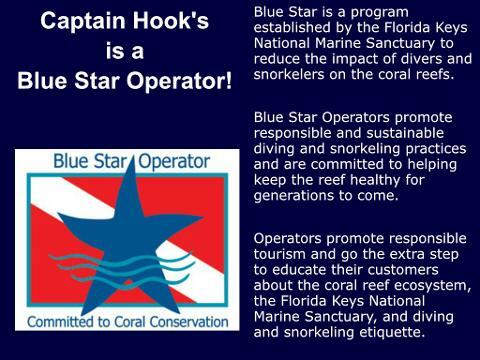 Hooks, we provide a complimentary divemaster with each dive trip. 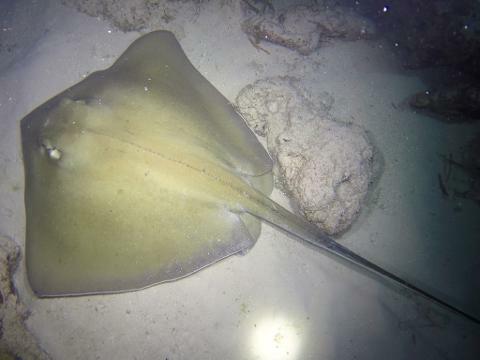 They know the reef and the local marine residents, and they can point out the highlights on our dives. Having a divemaster in the water has helped many of our divers that have not been diving in a while to reach a higher comfort level knowing there is someone nearby who can help. The divemaster is only there if you want to use them as a guide, it is your choice, and many of our divers explore on their own with their dive buddy. 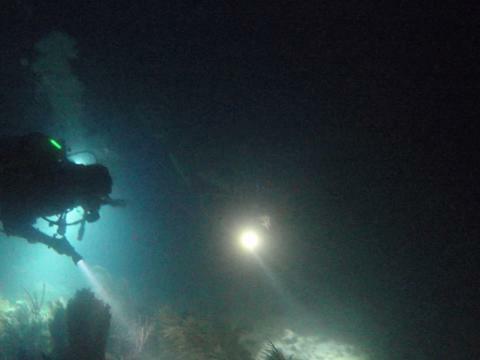 The Night Dive requires three divers for the trip to be a go. Once we receive a request for this dive, by one or two divers, we go to work to fill the dive to the minimum requirement of three divers or more. Most often, we are successful in meeting the minimum requirement, but it is always a good idea to book the Night Dive in advance. Departure times: Departure times vary throughout the year because the sunset time varies as well. Check with our dive shop to see the time and location of departure before you have a sunset/night dive. Air, Tanks, Weights and Weight Belt are included with your dive trip price. 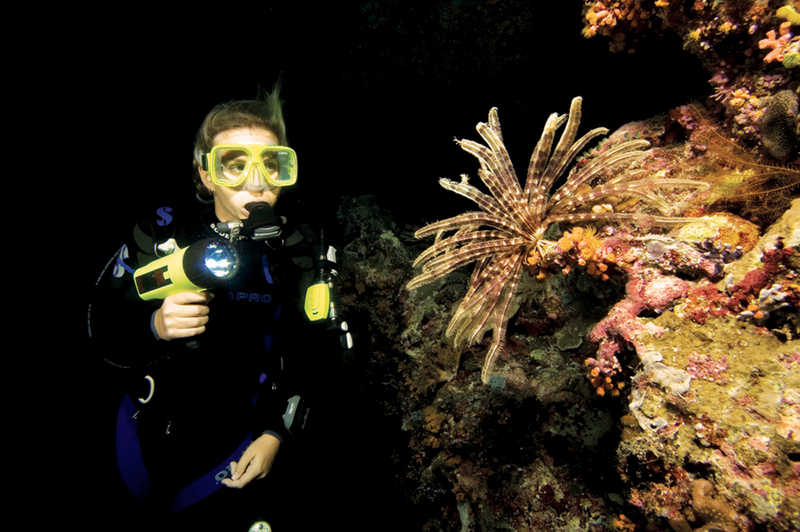 Underwater Dive Light - If you do not have a dive light, we have lights for rent, and you can order one as an optional extra during the booking process. It is always a good idea to stop in to see us @ Capt. Hook's Marina & Dive Center located @ 11833 Overseas Highway at Vaca Cut Oceanside when you arrive in Marathon. We love to see our adventurers before the event so we can get to know you, make friends and provide you with any detailed information about your activity. This activity needs at least 3 divers. If the minimum is not met, the activity may be cancelled, in which case you will be allowed to reschedule (subject to availability), receive full refund, store credit or receive credit for a future event/dive trip.